Use Desktop Shortcut Software Utility to create shortcuts on desktop to control your windows computer. Easy to use and configurable Desktop Shortcut Software Utility is really simple utility to create and use shortcuts on Desktop. There are many Windows Control features for which you can create desktop shortcut with this easy to use utility. Have a look at the given below screenshot which displays few of the windows control functions for which desktop shortcuts can be created. Watch a Video Tutorial about this really tiny and useful software utility to create Windows Control Desktop Shortcuts. The Video tutorial displays all the functions in this desktop shortcut software. Yes there will be more shortcuts added to this Desktop Shortcut Utility and yes you can suggest another appropriate function to be added in this software utility. Download and try out this Desktop Shortcut utility on your own Windows Computer. 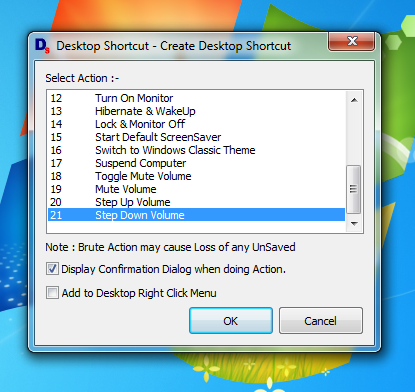 Whether you are using Windows 8, Windows 7, XP or Vista, you can create single or multiple useful desktop shortcuts. In case you accidently delete any of the shortcuts created on the desktop, just use the software again to create another shortcut on desktop to control your windows computer. When creating Desktop Shortcuts with this utility, you can specify whether to display a confirmation screen of not. Depending on your choice of the confirmation screen when initiating the action to be performed by the software, the desktop shortcut will be named appropriately. The Confirmation Screen has by default a audible alert when initiating the action initiated by the desktop shortcut. The audible alert will be as per the action to be performed by the Desktop Shortcut.